Sudseezauber: I was secretly hoping she would choose this one to send! It was the first soap on her blog that I ever saw, and I was hooked on her soaps from that moment on! Her design techniques are something to aspire to; wispy swirls and perfectly chosen complimentary colors! This is fragranced with Bermuda Triangle, which is a lovely fruity tropical fragrance oil. Greenery: Stunning again, done in different shades of green. She mentioned on her blog post that she used Aloe Vera and Cucumber f.o. in this soap and that it disappeared in the CP. I can very, very faintly smell some fragrance but I’m not sure if I’m picking up some fragrance from the other bars it was packed with. 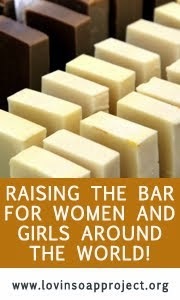 Even unscented it is a gorgeous bar, I’m impressed with how white and how hard her soap bars are. 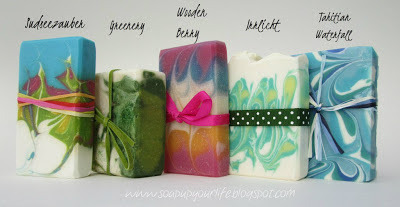 Wooden Berry: Another absolutely gorgeous combination of colors and swirls, the fragrance she chose completely compliments the design of this soap! This is fragranced with Tayberry and Teakwood, which smells like a smooth combination of berries and wine to my nose. Irrlicht: This fantastic-looking soap won Angela 2nd place in a soap competition, which doesn’t surprise me at all...it’s one of the prettiest hanger swirls I have ever seen! This soap contains silk and soy cream and is fragranced with Brazilian Jackfruit, which is a gorgeous fruity/floral combination. Tahitian Waterfall: This fragrance smells absolutely divine too; crispy clean and floral, it went straight onto my NG wish list along with the others! 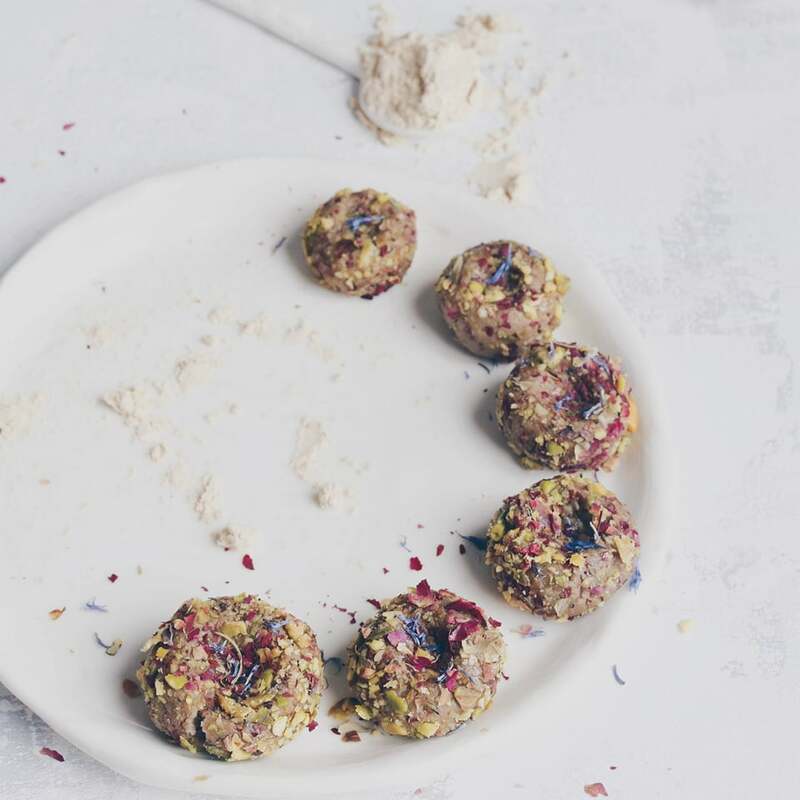 This soap is made with coconut, lard, olive, peanut and castor oil. I was looking forward to trying a lard soap as I have never made or tried one before, but I hear lots of positive things about its properties in soap. She used a column swirl technique to mimic a waterfall with her fluid swirls…aren’t they stunning? The lather on her soaps is incredible; creamy but yet bubbly at the same time, a really rich, luxurious lather. Her soaps left my skin feeling and smelling fantastic! Angela was so thoughtful and even surprised us with some candy from Germany and a postcard of the area that she is from along with a nice handwritten note! It was truly a pleasure exchanging soaps with you Angela, and I hope we get an opportunity to swap again one day! I hope you take the time to visit and join Angela’s blog, Soap Up Your Life; what I have shown you here is such a small sampling of all of the wonderful soaps that she makes and shares on her blog. I hope everyone is enjoying a happy and relaxing holiday with their loved ones! Oh Cee, you are so kind. It was a real pleasure to swap with you, I love all your soaps. I had a great time swapping with you too Angela! Wishing you a very Merry Christmas and all the best for 2013! I've seen both of your posts, all soaps are amazing! I just love what you do, girls! Cee, you have made a bulky stock of soaps, swapped and bought, you will have to employ all your family to help you consume them! mmmm... what a funky soap! Looks exactly like something I would pick up in the store. yummy! Funky is a perfect word to describe them...very cool and colorful! Wow, so many soaps, Cee! And they are all so beautiful! Merry Christmas to you too Natalia, I hope you are having a great holiday! Perfect color combinations and beautiful swirls. All soaps are so inspiring... Merry Christmas Cee! Merry Christmas Gordana, and all the best for the new year! Gorgeous! I wish there was a scratch 'n sniff on the computer cuz I'd love to smell them as well. The ribbons are such a nice touch too, perfect complement to the soap colours. 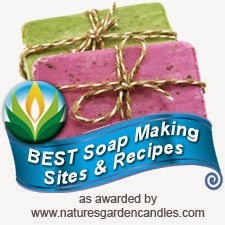 I enjoy Angela's blog, too, and her soaps are gorgeous! It looks like she sent you some lovely bars. I hope you had a merry Christmas, Cee Gee! Absolutely lovely! Her colors are beyond amazing. Hi April...her soap is an inspiration for sure! Gorgeous soaps, I love the Tahitian Waterfall.